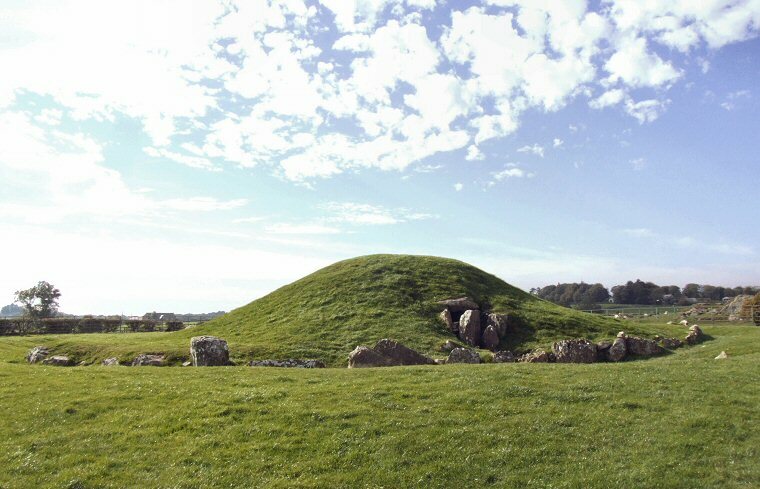 View of the restored mound of Bryn Celli Ddu from the east. 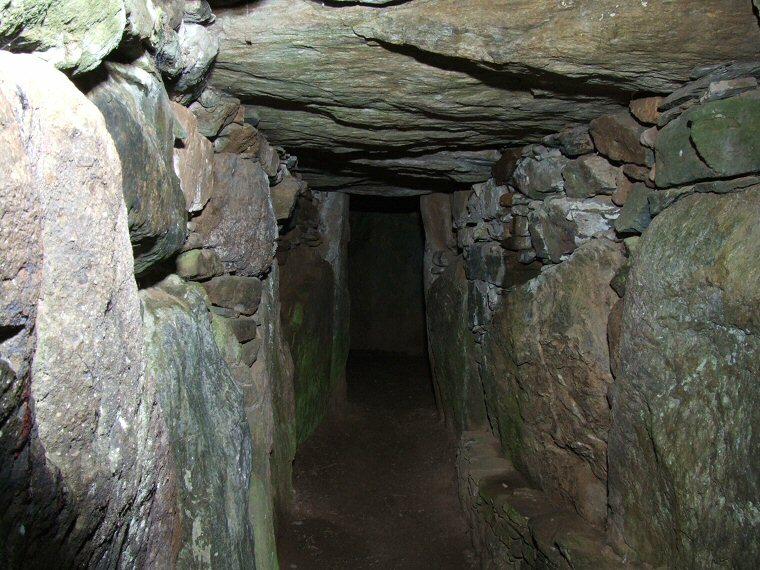 It is unclear how this passage tomb started life - there are two theories. The first is that it began as a henge monument with an internal stone circle - a circle henge, with a 32 metre diameter ditch and 14 stones. Within this circle a pit was dug which was found to contain a burnt human ear bone, the pit being covered with a capstone and an ornately carved slab. 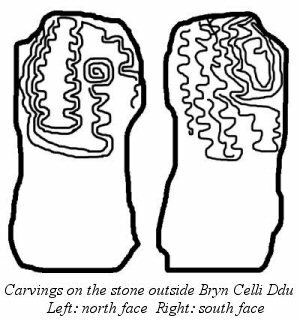 This appears to have been buried on its side but carvings on both faces and along the top suggest that it once stood upright - it bears some resemblance to carved stones found at similar sites in Ireland and also at Barclodiad-y-Gawres 11 miles (18km) due west. A replica of this slab now stands outside the entrance to the tomb, close to where it was found. Later the stones of the circle were broken and toppled and the tomb was built over the site. This consisted of a 26 metre wide outer double kerb of stones with a northeast 1 metre wide entrance that leads over 7 metres to an off-centre chamber made up of 6 uprights, one of which has a spiral carving. 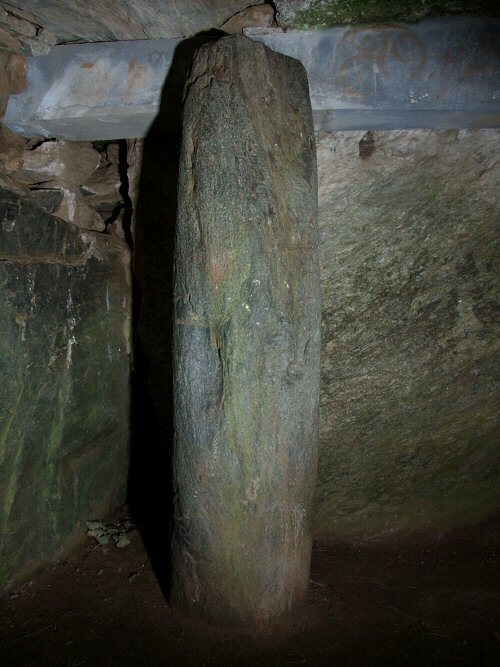 Within the chamber there was a freestanding cylindrical pillar and the whole interior was covered with 2 capstones. The earthen covering that can be seen today was built after excavation and reconstruction of the site, it would originally have been larger. 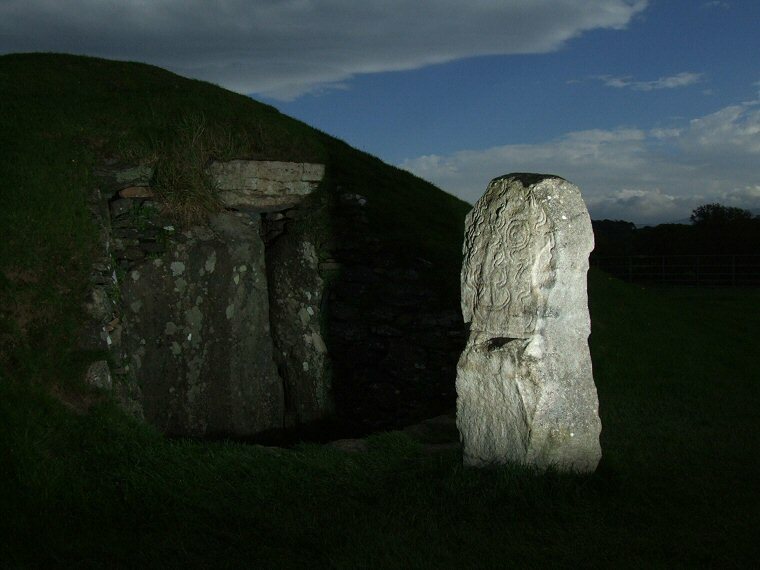 A second theory suggests that there was never a henge structure at all, but that a smaller passage grave was built into the mound with an outer kerb of stones. At some later time both the passage and the mound was enlarged, the old stones covered and a new outer kerb built. Among the finds finds from the site are two flint arrow heads, limpet and mussel shells, a stone bead as well as the remains of a small ox found beyond the mound. Update: Two researchers, Rupert Soskin and Michael Bott have suggested that the pillar that stands within the chamber is in fact the petrified remains of a tree trunk. Close inspection of the pillar reveals that it does indeed bear a striking resemblance to bark of a tree, what is unknown at the moment however is whether the pillar is indeed petrified wood or natural rock which was chosen by the tomb builders because of its unusual appearance. 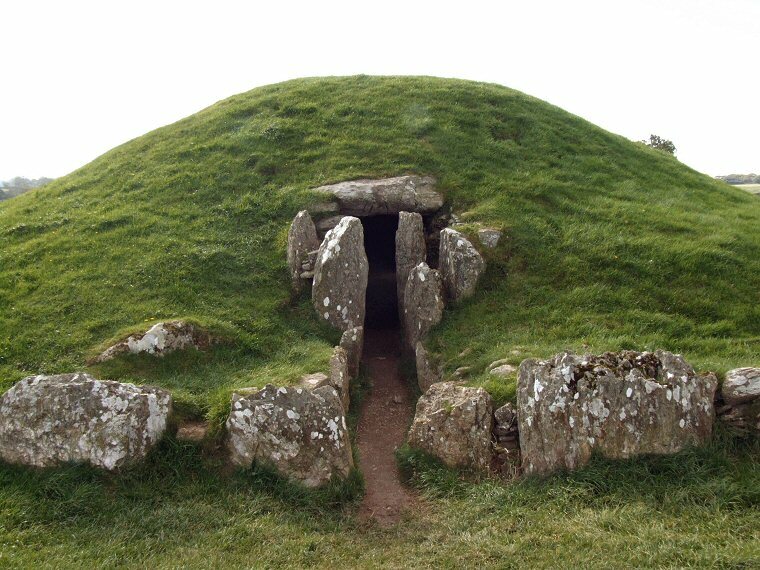 View of the entrance to Bryn Celli Ddu which is located on the northeastern side of the mound. Bryn Celli Ddu passage. This view is taken from just inside the entrance looking towards the chamber. Pillar set within the chamber - is this a petrified tree trunk? The replica carved stone outside the rear of the chamber. 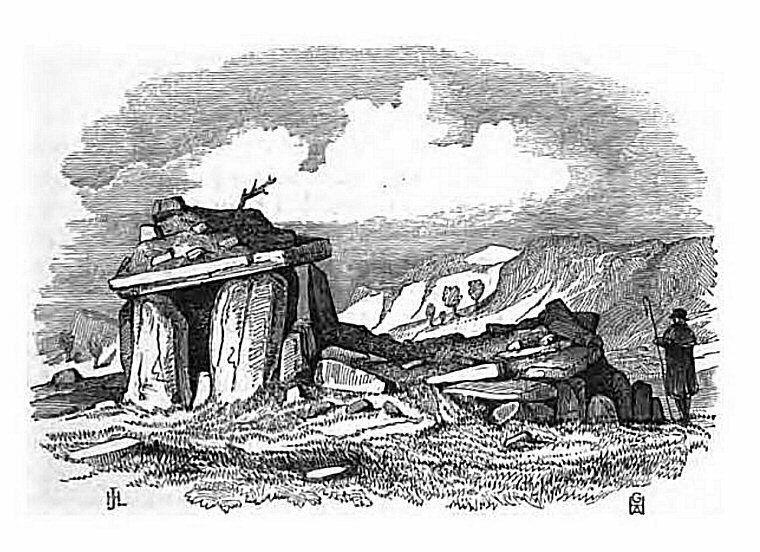 An engraving from an article entitled 'Cromlech at Bryn Celli Ddu' in Archaeologia Cambrensis (1847) shows how the tomb looked in the mid 19th century, 100 years before it was excavated and restored.